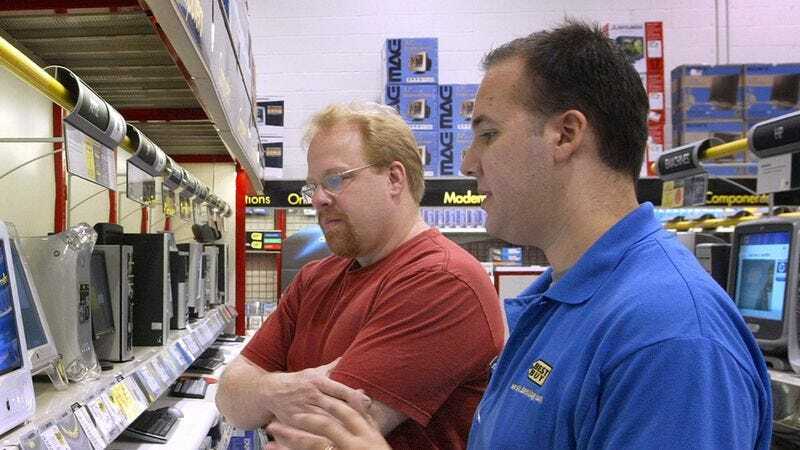 HAMILTON, OH—Despite being the beneficiary of numerous societal advantages and having faced little to no major adversity throughout his life, local man Travis Benton has spent the last four years squandering his white male privilege on a sales floor job at Best Buy, sources confirmed Tuesday. “You can get by with a regular HDMI cable, but if you’re looking at a length longer than 10 feet, I’d go with a gold-tipped one,” said the man dressed in a bright blue polo shirt and pin-on name tag as he continued to fritter away such innate life advantages as greater access to higher education, leniency from the justice system, and favorable treatment from other white males who lead and make hiring decisions at a disproportionately high number of American companies. “The AudioQuest gold-tip is actually the cable I use in my own home entertainment center and it provides excellent audio and video clarity, plus it comes with a full five-year warranty, unlike the 90-day warranty of a bargain brand. For your money, you’re not going to find a better cable.” At press time, the man born into the world’s most affluent and privileged socioeconomic group was spending his 15-minute break silently consuming a sleeve of Donettes purchased out of a vending machine.